I have a set of '79 GT front springs that I acquired from a TB member a few years back but never installed. Three 240s later I'm thinking of using them. 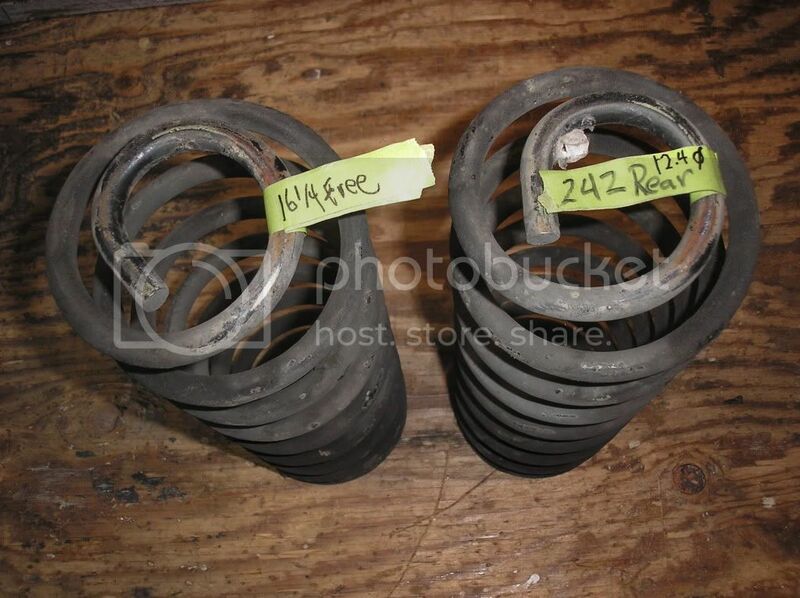 I see that all the major suppliers are now listing this HD spring 1229337 as the only available "stock" replacement. (14.5mm coil with about 16-3/8" free length) That's what my GT springs measure. Before I decide to use them I'm looking for feedback on what I should expect if I install them on my '84 242 DL. Car is all stock right now with Volvo hydraulic shocks. Suspension is tight so if I'm going to take it apart it is for upgrading the suspension. Not interested in lowering but could go with IPD bars and gas shocks. I've been using the aftermarket ones with those measurements for over ten years on my 93 wagon. I like them very much. They still have a good ride but are firmer for much better handling. I would definitely use gas shocks with them as that is also what Volvo did. It won’t sit lower. It may sit slightly higher in the front. That’s the way a 79 GT sat when new. This is true also because the 79 GT has the strut tower plates and they raise the car about 1/4" Like on my 93 wagon. I have a pair from 15A that I also bought some time ago. Might as well put all this stuff to good use. My only hesitation is because of how nice this car rides as is. I do like firmer, more controlled suspensions though. Another concern is what to do about the rear if I use the stiffer front springs. Other threads suggest keeping the stock rear springs but use firmer shocks out back. Stock 242 springs are pretty thin wire. I'd be tempted to put stock 244 springs back there to try to match / improve the rates, and possibly snip a coil if it gets too jacked up. That said the 79GT springs and old school IPD overloads are a good match, ride a little firmer but not harsh, but I have a good inch of rake that I live with until I do carry some significant weight. Yeah but this is a 242. The most weight I carry is a full tank of gas. You think with the GT fronts and OEM rears I would have a rake? Oh wait....are you sayin' the 244 rears are stiffer than 242? Wouldn't think that'd be the case. One way to find out measure twice, install once. The rear doors do add some weight in the back I'm pretty sure the Volvo engineers made both chassis' sit right. Last edited by Redwood Chair; 01-11-2019 at 07:07 PM..
Duh! Yeah those doors be heavy. So try with stock 242 rears and if too squat sub with 244 sedan first. Makes sense now. Start by comparing the springs you have on hand to make an educated decision. I was referring to stock Volvo strut tower plates which are quite thick. the 15A plates are a bit thinner and wouldn't raise the front as much as the plates from Volvo.